Orange you glad it's Orange Day?! Miss Christina's class, pictured above, sure was! 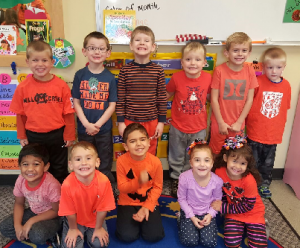 We have had such an exciting Orange Day at the Ark! The kids went on an orangey pumpkin adventure, and made exceptional orange art! It was an exciting day for all! There are currently no comments for Orange Day 2016. All information provided is provided for information purposes only and does not constitute a legal contract between Nancy's Noah's Ark and any person or entity unless otherwise specified. Information is subject to change without prior notice. Although every reasonable effort is made to present current and accurate information, LinkNow!™ Media makes no guarantees of any kind.